Front of the booklet of the 2001 Special Edition. Following a difficult period during where Walt Disney Feature Animation struggled to release successful animated feature films, the studio, inspired by their most recent animated success The Little Mermaid (1989), decided to adapt the fairy tale "Beauty and the Beast" into an animated musical film after a non-musical adaptation had been attempted that failed to impress Disney CEO Jeffrey Katzenberg. Katzenberg ordered that production on the film be started over from scratch, hiring songwriting team Howard Ashman and Alan Menken, who had just recently completed scoring The Little Mermaid, to write the film's songs. Dion and Bryson were hired to record a pop version of – and draw media attention to – the film's title song. Ashman, who was initially hesitant to join the project, died of AIDS before the film's completion and the album's release. Much like Beauty and the Beast, the soundtrack was a massive critical success, receiving universal praise and recognition from both film and music critics. The music featured on the album won several awards, including the Golden Globe Award for Best Original Score, the Academy Award for Best Original Score and the Grammy Award for Best Instrumental Composition Written for a Motion Picture or for Television. 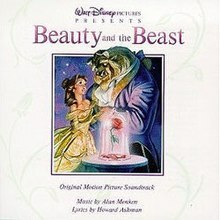 Its title track and only single, "Beauty and the Beast", achieved similar success, winning the Golden Globe Award for Best Original Song, Academy Award for Best Original Song and Grammy Awards for both Best Song Written for Visual Media and Best Pop Performance by a Duo or Group with Vocals. The soundtrack was also nominated for a Grammy Award for Album of the Year. In 2001, the soundtrack was re-released as a Special Edition to coincide with the IMAX re-issue of the film and the two-disc Platinum Edition. The new release featured the film version of "Transformation", which had been replaced with an early unused version in some early pressings, the newly animated song "Human Again", the original instrumental intended for the "Transformation" scene, (titled "Death of the Beast (Early Version)" here) and demos for "Be Our Guest" and the title track. In October 2010, the soundtrack was re-released again as a Diamond Edition soundtrack, to coincide with the successful Blu-ray and DVD Diamond Edition release of the film, the 1991 version of the soundtrack was released and included Jordin Sparks' cover of "Beauty and the Beast" as a bonus track. The soundtrack was reissued as the fourteenth entry in The Legacy Collection on February 9, 2018 and includes previously unreleased score. During the 1970s and 1980s, Walt Disney Feature Animation struggled to release animated feature films that achieved the levels of success of some of the studio's earlier productions did. In 1989, Walt Disney Pictures released The Little Mermaid. An animated musical that features songs written by lyricist Howard Ashman and composer Alan Menken, The Little Mermaid was both a tremendous critical and commercial success. Hoping to release a film that achieved similar success, the studio decided to adapt the fairy tale "Beauty and the Beast" by Jeanne-Marie Le Prince de Beaumont into an animated film. Prior to getting professionally involved with Disney, Ashman and Menken had collaborated on a musical adaptation of Little Shop of Horrors and its subsequent musical film adaptation. Following the studio's attempt to adapt the fairy tale into a non-musical animated film under the direction of Richard Purdum, Disney CEO Jeffrey Katzenberg, dissatisfied by the direction in which the film was headed, ordered that it be scrapped and restarted from scratch, this time in the form of a musical. In addition to hiring a screenwriter, Katzenberg recruited Ashman and Menken to write the film's songs. Ashman was initially reluctant to agree to work on Beauty and the Beast because he had just recently been diagnosed with AIDS. Additionally, he had already begun writing songs for Aladdin (1992). Ashman's health began deteriorating soon after he completed The Little Mermaid. However, he wanted his illness to remain secret and decided to tell few about it. Too weak to travel, Ashman requested that he be allowed to work on the film's songs from his home, causing Menken and the filmmakers to frequently travel from the film's studio in Burbank, California to his home in New York in order to collaborate with him. Ashman wrote the majority of the song's lyrics from his deathbed. It was later revealed that he viewed the Beast's curse as an allegory for AIDS, and that the mob song 'Kill The Beast' was inspired by public sentiment at the time against AIDS and the gay community. Lyricist Howard Ashman and composer Alan Menken intended for the songs in Beauty and the Beast to serve as plot devices and assist in the telling of its story. According to Menken, the film's songs grew out of the fact that the film was written to "almost ... exist as a stage musical." Stylistically, Ashman and Menken drew creative influence from several musical styles and genres, including French, classical and Broadway music, using them as reference and inspiration when composing the film's songs. Menken also revealed that the film's songs and score tend to convey a wide variety of emotions, ranging from poignancy to humor and joy. While composing the orchestral score that accompanies the film's prologue, Menken was inspired by the French suite The Carnival of the Animals by Camille Saint-Saëns, referring to it as his own version of Saint-Saëns' composition. Menken believes that all properly structured musicals should feature an "I Want" song because they are essentially "about a character having a big dream, then [there's] some obstacle to that quest." "Belle", the film's opening number, is an "orchestra-driven", "snare-tapping" song. Accompanied by a full orchestra, it is considered Beauty and the Beast's "I Want" song. Musically, Menken based "Belle" on the narrative style of a traditional operetta, describing it as "something to portray Belle in a world that is so protected and safe." Menken described the film's following musical number, "Gaston", as a hilarious "drinking song sung by basically a group of Neanderthal level guys in praise of a complete lug-head", referring to Ashman's choice of song lyrics as humorous and "tongue in cheek". When it came time to write the film's large-scale "scintillating" musical number "Be Our Guest", Menken originally composed and provided Ashman with a simple melody that was initially intended for temporary use only, simply for the purpose of allowing his co-writer to start developing the song's lyrics. He labeled the rough composition "the dummy". However, Menken eventually gave up on his attempt to improve upon the song's simple melody, and it ultimately became the version to which Ashman wrote his lyrics. Menken described "Be Our Guest" as a song that is both "simple and tuneful" that "let[s] the lyric shine." Originally, Ashman and Menken had written a rather lengthy, large-scale musical number for the film called "Human Again". However, when it was deemed "too ambitious", they swiftly wrote and replaced it with a smaller-scale musical number entitled "Something There". According to Menken, the film's theme and title song, "Beauty and the Beast", was "a very hard song to come by" despite its relative simplicity. He revealed that the writing process for "Beauty and the Beast" was the longest period of time that he had ever devoted to one particular song. Written to resemble a lullaby, Ashman and Menken conceived "Beauty and the Beast" as "a song that could have a life outside the movie." The film's final musical number, "The Mob Song", was written as what Menken described as "a macho adventure underscore". When the film was released, it garnered three separate Academy Award nominations for Best Original Song for "Belle", "Be Our Guest" and "Beauty and the Beast". Producer Don Hahn expressed concern that this would cause confusion among audiences and voters, and potentially result in an unfavorable tie. In order to prevent this from happening, the studio fought in favor of the film's title song and decided to release a pop rendition of "Beauty and the Beast" as a commercial single in an attempt to persuade voters to vote for it. When "Beauty and the Beast" was written, it was composed with the potential of having "half a life outside the movie." Menken revealed that this was the first time one of his compositions had been rearranged and "turned into ear candy". Menken recruited musician Robbie Buchanan to arrange "Beauty and the Beast" into the form of a pop duet while Walter Afanasieff was responsible for producing the track. Afanasieff also assisted Buchanan in the arranging of the song. Menken was ultimately pleased with Afanasieff's production, explaining, "Walter Afanasieff ... took it and really molded it into something very different than I ever intended and I grew to love it. In a way, Walter made it his own, and I love that." Because Disney could not afford to hire a "big singer", they drafted Canadian singer Celine Dion, who was relatively new to the music industry at the time, to record "Beauty and the Beast". However, the studio feared that she would not draw much media attention because of her relative obscurity in the United States, so they hired American singer Peabo Bryson, who was a more well-known recording artist at the time, to perform alongside her. The newly arranged song was released as the album's lead single on November 25, 1991. Similar to the overwhelmingly positive critical response that the film received, Beauty and the Beast: Original Motion Picture Soundtrack was met with universal acclaim from both music and film critics, garnering nearly unanimous praise for both its songs and score. Tavia Hobart of AllMusic awarded the soundtrack a nearly perfect overall score of 4.5/5 stars, describing Ashman and Menken's compositions as "positively delightful." However, she felt that the album's orchestral score was not as good as The Little Mermaid. Filmtracks was very enthusiastic about the album, praising each of its songs and labeling them "remarkably upbeat". The reviewer also praised Ashman and Menken for avoiding "stupid comedic performances to appeal to children." Unlike AllMusic's opinion, the reviewer felt that the score was "a vast improvement" over The Little Mermaid's. Sputnikmusik's Irving Tan awarded the album a "superb" overall rating of 4.5/5. Praising the film's entire collection of songs in a detailed review, Tan accredited the overall appeal of the soundtrack with much the film's success. When Beauty and the Beast was released in November 1991, several film and entertainment critics awarded specific praise to its music, both songs and score. Entertainment Weekly's Lisa Schwarzbaum wrote, "The songs unleash a chemical reaction of happiness." Just as the film made history by becoming the first animated film to receive a Best Picture Oscar nomination, so too the soundtrack made history by becoming the first animated film soundtrack to receive an Album of the Year Grammy nomination (to date, no other animated film soundtrack has been nominated in this category). The pop version of the title track "Beauty and the Beast" also received Grammy nominations for Record of the Year and Song of the Year. In total, the soundtrack won 3 Grammys for Best Pop Duo/Group Performance (Celine Dion & Peabo Bryson, Best Pop Instrumental Performance (Richard Kauffman), and Best Song Written for a Motion Picture (Alan Menken). In the movie track eight comes after track nine. All music composed by Alan Menken with lyrics by Howard Ashman. All scores composed and produced by Menken. All songs produced by Menken and Ashman except track 15 produced by Walter Afanasieff. A^ Nominated for the Academy Award for Best Original Song. B^ Won an Academy Award for Best Original Song. C^ Produced by Robert Buchanan. D^ New song integrated into the film for the 2001 Special Edition IMAX re-issue and 2001 DVD release. E^ Integrated into the film's end credits for the 2001 Special Edition IMAX re-issue and 2001 DVD release. On initial pressings of the original release of the soundtrack, this cue replaced the version used in the film up until the moment when the transformation begins. Eventually the album was re-pressed with the film version of the cue and has been presented in its proper film version on the 2001 and 2010 reissues. Walt Disney Records released a two-disc soundtrack album of Beauty and the Beast as part of The Legacy Collection. It includes the complete score and early demos. ^ Sunderland, Mitchell. "Beauty and the Plague". Vice. Vice. Retrieved 18 September 2013. ^ a b Murray, Rebecca. "Exclusive Interview with Alan Menken on 'Tangled'". About.com. About.com. Retrieved 17 September 2013. ^ a b c d e f Greenberger, Robert (October 2, 2010). "Alan Menken Revisits 'beauty & The Beast'". Comic Mix. Comic Mix. Retrieved 18 September 2013. ^ "Interview with Beauty and the Beast Composer Alan Menken". Static Multimedia. Static Multimedia. October 4, 2010. Archived from the original on 21 September 2013. Retrieved 17 September 2013. ^ Blauvelt, Christian (November 24, 2010). "Alan Menken discusses 'Tangled' and the past, present, and future of the animated musical". Entertainment Weekly. Entertainment Weekly Inc. Retrieved 17 September 2013. ^ a b Tan, Irving (April 10, 2011). "Disney Soundtracks - Beauty and the Beast". Sputnikmusic. IndieClick Music Network. Retrieved 18 September 2013. ^ a b Carlos (December 10, 2010). "Beauty and the Beast". Celine Dion. Sony Music Entertainment Canada Inc. Retrieved 17 September 2013. ^ a b Kois, Dan (November 24, 2010). "Tangled Looks and Feels Great, So Why Is Disney Selling It Short?". The Village Voice. Village Voice, LLC. Retrieved 17 September 2013. ^ a b Dickey, Timothy. "Alan Menken Beauty and the Beast, film score". AllMusic. All Media Network, LLC. Retrieved 18 September 2013. ^ a b Rees, Jasper (May 16, 2010). "theartsdesk Q&A: Composer Alan Menken". The Arts Desk. The Arts Desk Ltd. Retrieved 18 September 2013. ^ a b Young, John (February 22, 2012). "Oscars 1992: Producer Don Hahn on how 'Beauty and the Beast' changed animation". Entertainment Weekly. Entertainment Weekly Inc. Retrieved 17 September 2013. ^ a b c Lammers, Tim (October 5, 2010). "Menken Still Enchanted By Beauty Of 'Beast'". Internet Broadcasting. Internet Broadcasting. Retrieved 17 September 2013. ^ "Alan Menken, Howard Ashman – Beauty And The Beast (Original Motion Picture Soundtrack) (Special Edition)". Discogs. Discogs. Retrieved 18 September 2013. ^ "Robbie Buchanan". Allmusic. All Media Network, LLC. Retrieved 18 September 2013. ^ "Stephen Schwartz and Alan Menken Interview – ENCHANTED". Collider. Collider.com. November 21, 2007. Retrieved 17 September 2013. ^ Hogan, Ed. "Walter Afanasieff". Allmusic. All Media Network, LLC. Retrieved 17 September 2013. ^ "Walter Afanasieff". Pop Tower. Pop Tower. Retrieved 17 September 2013. ^ "Motion Pictures". Walter Afanasieff. Walter Afanasieff. Retrieved 17 September 2013. ^ Hobart, Tavia. "Beauty and the Beast - Disney, Alan Menken". Allmusic. All Media Network, LLC. Retrieved 2010-05-29. ^ Schwarzbaum, Lisa (January 12, 2012). "Beauty and the Beast 3D (2012)". Entertainment Weekly. Entertainment Weekly Inc. Retrieved 18 September 2013. ^ "Australiancharts.com – Soundtrack – Beauty and the Beast". Hung Medien. Retrieved September 25, 2018. ^ "Irish-charts.com – Discography Soundtrack". Hung Medien. Retrieved September 25, 2018. ^ "Dutchcharts.nl – Soundtrack – Beauty and the Beast" (in Dutch). Hung Medien. Retrieved September 25, 2018. ^ "Charts.org.nz – Soundtrack – Beauty and the Beast". Hung Medien. Retrieved September 25, 2018. ^ "Spanishcharts.com – Soundtrack – Beauty and the Beast". Hung Medien. Retrieved September 25, 2018. ^ "Soundtrack Chart History (Billboard 200)". Billboard. Retrieved September 25, 2018. ^ "Soundtrack Chart History (Soundtrack Albums)". Billboard. Retrieved September 25, 2018. ^ "Canadian album certifications – Various artists – The Beauty and the Beast Soundtrack". Music Canada. Retrieved September 25, 2018. ^ "British album certifications – Walt Disney – Beauty and the Beast". British Phonographic Industry. Retrieved September 25, 2018. Select albums in the Format field. Select Silver in the Certification field. Type Beauty and the Beast in the "Search BPI Awards" field and then press Enter. ^ "American album certifications – Soundtrack – Beauty & the Beast". Recording Industry Association of America. Retrieved September 25, 2018. If necessary, click Advanced, then click Format, then select Album, then click SEARCH. ^ "D002679402 | The Legacy Collection: Beauty and the Beast - VGMdb". vgmdb.net. Retrieved 2019-03-26.